The scholarship of teaching and learning arose as part of a “broader transformation in the intellectual culture of higher education” (Hutchings, Huber, & Ciccone, 2011, p. 2), which itself emerged out of a paradigm shift, from “colleges as institutions that exist to provide instruction” to “colleges as institutions that exist to produce learning”. Preceding this shift at the college level was widespread concern over the quality of education at post-secondary institutions. Following World War II, professors’ roles came to increasingly overemphasize research, with the research role eventually eclipsing the teaching role. These conditions created the institutional culture referred to in the above-stated conceptualization: colleges came to be places that merely “provide instruction” to students – star researchers transmitting their knowledge to students in a one-way flow, with little thought given to student learning. Over time, this institutional culture and corresponding model of teaching in post-secondary institutions came to be a source of concern due to the perceived lack of skill and ability among graduates of such institutions (Hutchings, Huber, & Ciccone, 2011). Such pressures prefigured the shift in the conceptualization of colleges and an emphasis on student learning emerged as a result. However, a complete understanding of SoTL scholarship requires an introduction to the contributions of one scholar, Ernest Boyer. In 1990, Ernest Boyer wrote Scholarship Reconsidered: Priorities of the Professoriate, the book that came to be credited with sparking the line of inquiry known as the scholarship of teaching and learning. As mentioned in the previous section, the historical conditions were ripe for Boyer’s insights, with decades of (arguably) an over-emphasis on the research role of professors resulting in serious concerns over the under-education of college graduates. Boyer’s basic argument was that it was time to get beyond “the tired, old research vs. teaching debate and define, in more creative ways, what it means to be a scholar” (p. xii). To make his argument, Boyer framed four types of scholarship: discovery, application (which came to be changed to ‘engagement’), integration, and teaching (and the latter was eventually extended to include learning), and demonstrated that polarity between them, particularly between teaching and research, is false. Boyer subjected each to a standardized set of criteria and demonstrated that what is traditionally thought of as scholarly or academic work can be expanded to include the teaching and service roles of professors without compromising the standards upholding the research role. In effect, Boyer showed that in each domain – discovery, teaching, engagement, and integration – a scholarly approach is both required and appropriate, without contradiction. 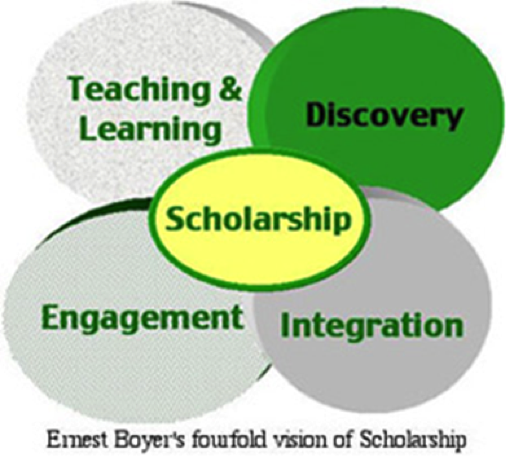 The four types of scholarship served to establish the foundation of a new paradigm being advanced by Boyer, one that gives equal weight to the teaching, research, and service activities of an academic and advanced the view that if university faculty are to take a scholarly approach to their teaching – asking questions about its effectiveness and then testing them – then promotion and reward systems ought to account for this in their criteria. Herein lies Boyer’s legacy: from the annals of SoTL research to the mission statements of every type of post-secondary institution, the conception of teaching and learning as a form of scholarship has become firmly rooted. The Centre for Discovery in Learning at the University of Saskatchewan, adapting earlier work by Herteis (2004), offers the following diagram conceptualizing Boyer’s paradigm. It shows the independent yet overlapping relationship between the four types of scholarly work and their fundamental unity under the banner of scholarship. Boyer, E. L. (1990). Scholarship reconsidered: Priorities of the professoriate. San Francisco, CA: Carnegie Foundation for Advancement of Teaching. Hutchings, P., & Shulman, L. S. (1999). The scholarship of teaching: New elaborations, new developments. Change, 31(5), pp. 10-15. Hutchings, P., Huber, M. T., & Ciccone, A. (2011). Scholarship of Teaching and Learning Reconsidered: Institutional Integration and Impact. San Francisco, CA: Jossey-Bass. McKinney, K. (2006). Attitudinal and structural factors contributing to challenges in the work of the Scholarship of Teaching and Learning. New Directions for Institutional Research, 129 (Summer), pp. 37-50. Trigwell, K., Martin, E., Benjamin, J., & Prosser, M. (2000). Scholarship of Teaching: A model. Higher Education Research & Development, 19(2), 155-168.